Sugar Pine Square – FRESNO, CA (JUNE 5, 2012) –McCormick, Barstow, Sheppard, Wayte & Carruth LLP celebrated with a ground breaking ceremony today at the site of their new office building to be located on the northwest corner of El Paso and Fresno Streets. Working with Zinkin Development, the firm broke ground on a new 68,000 square foot three story office building that will be able to comfortably house 105 attorneys. McCormick Barstow will lease the building from Zinkin Development in the late fall of 2013. In attendance at the ceremony were Lee Brand, City Councilman for District 6, Nick Zinkin and DeWayne Zinkin of Zinkin Development, and several of the law firm partners, including: Lowell Carruth, Jeff Reid, Todd Baxter, Stephen Carroll, and Ken Baldwin. The law firm of McCormick, Barstow, Sheppard, Wayte & Carruth LLP is the largest law firm in the San Joaquin Valley. McCormick Barstow is a Martindale-Hubbell AV® Preeminent™ Peer Review Rated law firm committed to providing the highest quality legal representation. The firm combines the individual talents of attorneys with diverse backgrounds and experiences into a multi-faceted civil law firm. 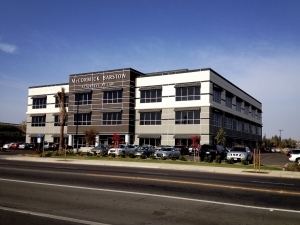 McCormick Barstow has offices in Cincinnati, OH; Denver, CO; Las Vegas, NV; Modesto, CA; and Seattle, WA and expertise in over 20 practice areas.